For any smartphone user who owns an Android-based device and is slightly geekish, rooting comes as naturally as eating, sleeping, and other basic human instinct. Not only does it unlock the true potential of your device, but also makes it possible to run several apps that otherwise are out of question. Android, in this regard, also holds a great advantage over its fruity counterpart, iPhone, as the open source nature of the former makes it much easier to gain root level access on the device. The fact that Android developer community is huge doesn’t hurt either. Thus, whenever a new device comes out, people expectantly wait for the developers to work their magic and provide root methods. Now, it turns out, that you don’t have to even wait for the actual device to come out, because renowned developer Chainfire has rooted Samsung Galaxy S4 with a fully working auto-root mechanism. Before we get to the actual rooting guide, let’s take into account a few things to set the record straight. Earlier this week, news had been circulating the blogosphere about a root being available for Galaxy S4 prior to its release, which Chainfire himself denied. There might’ve been some truth to it as well, because the chipset in Samsung’s latest flagship makes it considerably more difficult to root by just pushing the SU binaries in place. Even now, the root that is available through Chainfire’s infamous auto-root package has certain limitations, in that it works with only a specific firmware and only on the Qualcomm-based Galaxy S4 LTE, GT-I9505. Still, it works just as well as any other Chainfire root, and we’ll guide you how you can get that on your device. This root mechanism works only on Samsung Galaxy S4 LTE GT-I9505, with the firmware XXUAMD2. All other variants and firmware versions are unsupported. Please follow these instructions at your own risk. Whilst being safe and coming from a renowned developer, we do not take any responsibility for any damage happening to your device as a result of following this procedure. Step 1: Download the necessary files from the source thread below, and unzip them to a convenient location. Step 2: Put your Samsung Galaxy S4 in Download mode using the button combination. Step 4: Under PDA, select the .tar.md5 file that you extracted from Chainfire Auto-Root package. Make sure that Re-Partition is unchecked, and don’t touch any other settings. Hit the Start button to begin flashing the new PDA. Step 5: Once flash is completed, the device will automatically reboot with a red Android logo, after which you’ll have root access. Step 6: If the boot happens without the red Android, manually reboot into recovery to initiate the process, and you’re good to go. 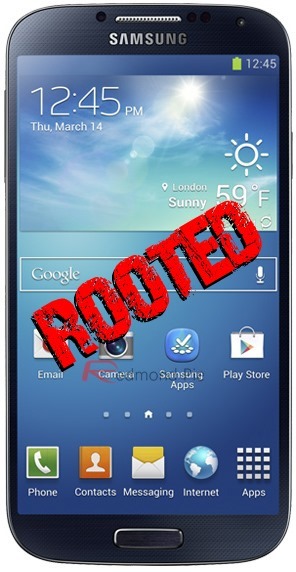 That’s it – enjoy root access on your Samsung Galaxy S4 LTE GT-I9505!